Task View is one of the most popular feature of Windows 10 which allows users to utilize virtual desktops. Through Task View, users can open and switch between multiple virtual desktops where each runs different applications. Virtual desktop is useful for power and advanced users who need a way to declutter the desktop when opening many apps at the same time. Windows 10 built-in support for virtual desktop is Task View. By default, the Task View icon is shown on the Taskbar for quick access to desktop switching and management (adding or removal). But if you are not using virtual desktop, Task View button is useless. Right click on any empty space or the Task View button itself on the Taskbar, and then deselect the Show Task View button. That’s it. To re-enable and show or unhide the Task View button, just reselect the same “Show Task View button” option. Look for a DWORD value named ShowTaskViewButton. By default, the value data is “1” for showing the Task View button on the Taskbar. Change it to 0 to hide it from Taskbar. 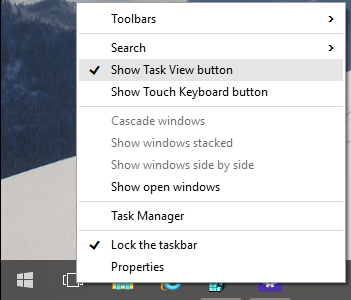 During the development of Windows 10, the hiding of Task View button was done via the “Enabled” value in following registry key.